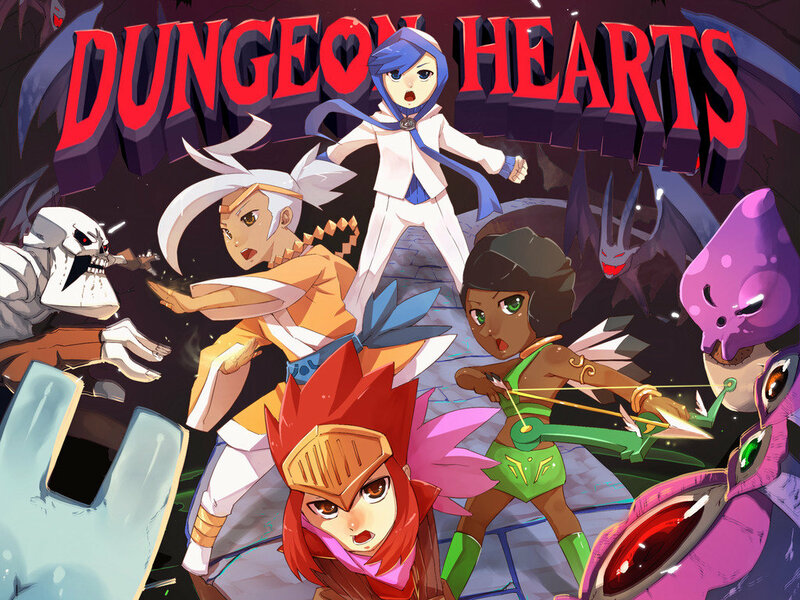 Dungeon Hearts was among one of my favorite titles that I saw at PAX East this year, so I was excited that the game was being released so soon after the show. It is an intense RPG / match-three hybrid with periods of seriously intense combat action that will have your fingers in a frenzy as you try to work out combinations in your head faster than your fingers can get to them. Dungeon Hearts offers a cool new twist on classic match-3 game play, adding a bit of action and depth to the somewhat tired genre. 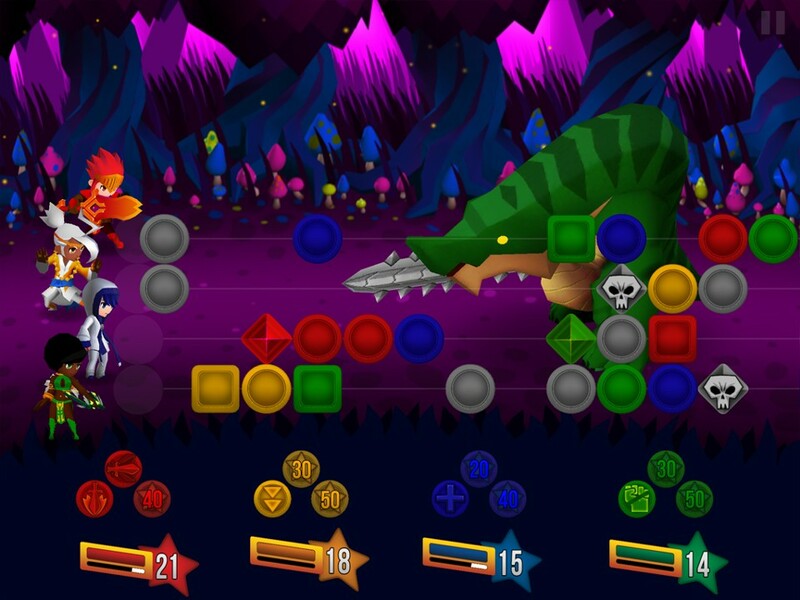 The game is laid out such that you have four heroes lined up in a column on the left side of the screen and next to them is the fate-stream, where all the action happens. A conveyor belt of runes flow across the fate-streams four rows toward the heroes. 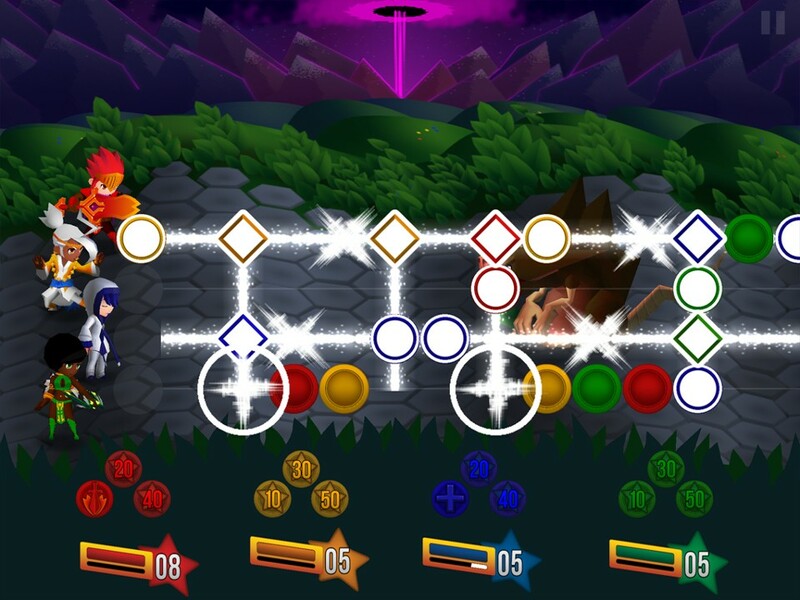 Players drag the runes around the maze-like fate-stream to form groupings of three like-colored runes (also known as chargers), which can be tapped to form a special striker gem. In turn, the striker can be used to attack the level’s enemy and/or the evil skull-shaped chargers and hexes on the fate-stream. When a striker is tapped, the hero of the corresponding color fires upon the level boss and any hexes or evil strikers that are inline with your striker on the fate-stream either horizontally or vertically are destroyed or damaged. If chargers or strikers make it all the way to the end of the fate-stream, they just drop off, however if enemy strikers or hexes make it to the end before they can be destroyed, then your hero in that row is attacked. There are also square chargers and enemy strikers which are unmovable as well as enemy strikers which take multiple hits to destroy. Enemy strikers deliver health damage, while hexes deliver varying effects depending on the type. For example, Blind Hexes will cause your hero to miss attacks, the Life Steal Hex, will take health from the affected hero and give it to the enemy, the Freeze Hex, renders the affected heroes’ strikers, chargers and skills useless for a period of time. There are a number of different hexes that get introduced as you progress through the game. If a hero is defeated, then chargers of his or her corresponding color will continue to surface on the fate-stream, but will be unusable for attacks and will just get in the way of your matchmaking. Defeated heroes are revived if you can survive the current battle. This is where the strategy comes in, or at least as much strategy as you can muster when you get flustered like Lucy and Ethel at the candy factory, frantically moving and reorganizing chargers and strikers to keep them from reaching the end while still trying to form and align strikers. If you can line up multiple strikers (of any color) you can create a more explosive combo attack as the tapped striker will activate any other strikers that fall into the same row or column. The more of your heroes that are part of an attack, the more damage you will do. You will also get an extra attack boost from any chargers of the same color as an activated striker in the same row or column. Combining three striker gems of the same color results in a super striker that basically wipes out the current runes on the fate-stream, buying you a little bit breathing room and while delivering a devastating blow to the enemy. After defeating an enemy, between levels a different sort of fate-stream will appear filled with colored stars called boosters. By forming and tapping groups of three boosters of the same color, you level-up the corresponding hero, increasing his health, strength and help unlock additional skills which can be used during battles. There are up to three skills that can be unlocked per hero and these can be things like healing your heroes, slowing down the fate-stream, or a special, more powerful attack. Skills have fairly stringent cooling down periods, so you need to use these sparingly. You are given a random selection of enemies to battle over the course of the game and there is a nice in-game bestiary which you can reference for more information about each. If I had one complaint, it is that the game’s difficulty ramps up pretty quickly and there is only one difficulty level….HARD! Despite a recent update that was supposed to help balance out the difficulty, I still find that things get rather intense too quickly. I also found it difficult to tell just exactly how much life the current enemy has left, so if (or rather when) you lose, you have no idea how close you were to defeating your current level’s foe. The game features multiple soundtracks which get unlocked each time you finish the game, but despite some valiant attempts I don’t see myself unlocking that chiptunes soundtrack any time soon. There is a lot to love about Dungeon Hearts including its nice graphics, fun, fresh and frenetic game play. The expedited ramp up in difficulty will frustrate some players, but if you stick with it, you will develop longer-term strategies that will allow you to make it further in the game. That being said, by the game’s very speed and nature, strategy will all too often times go right out the window as you are forced to take on a preservation role rather than lining up masterful combo attacks. If you’ve got what it takes to be a hero and want a match-3 game with meat, then by all means, I encourage you to step up and do battle.